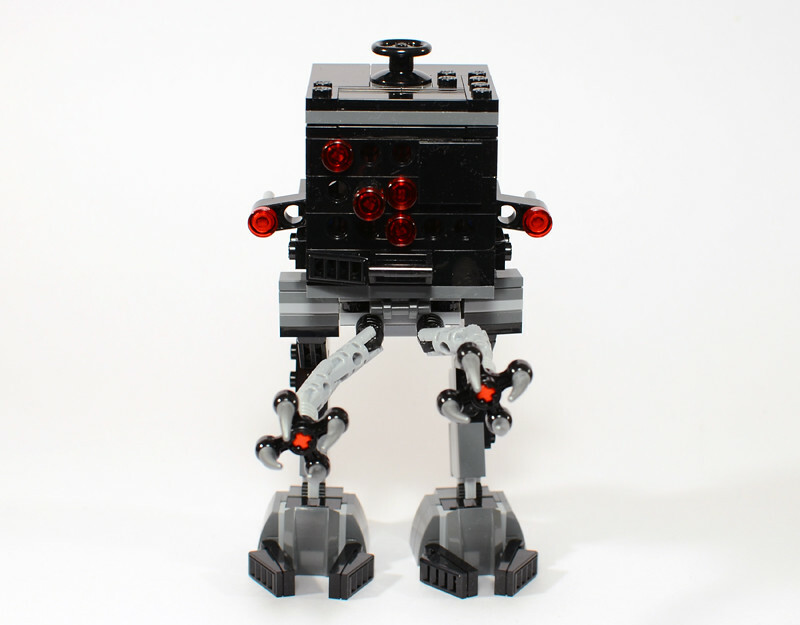 Mechs aren't really my thing, but LEGO definitely knows how to make them look exciting. The little Ninjago Fire Mech made me want to buy it just for the mech, and it looks fantastic. But bigger mechs don't usually do much for me. I only ever got a few small Exo-Force sets, but nothing bigger. 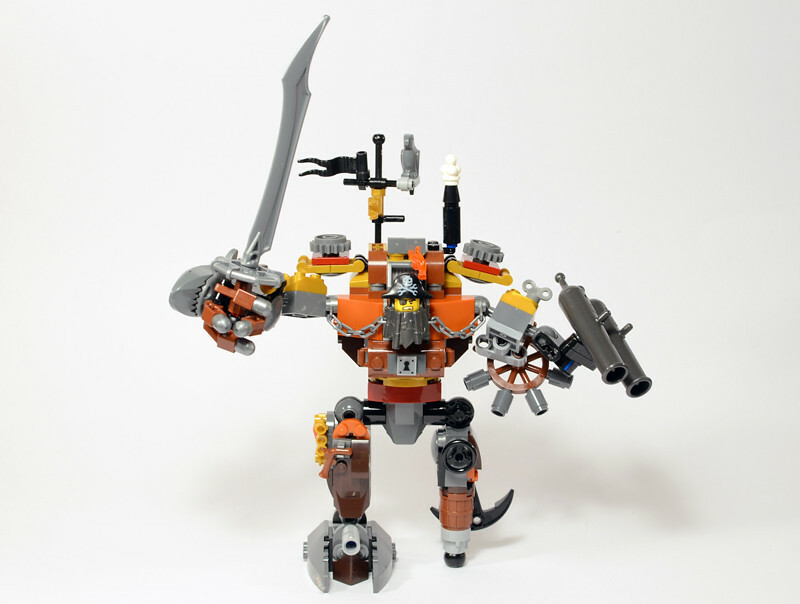 MetalBeard is interesting of course because he is a mech, but he's still a bigger-size mech and didn't interest me. Let's see if building him changed my mind. 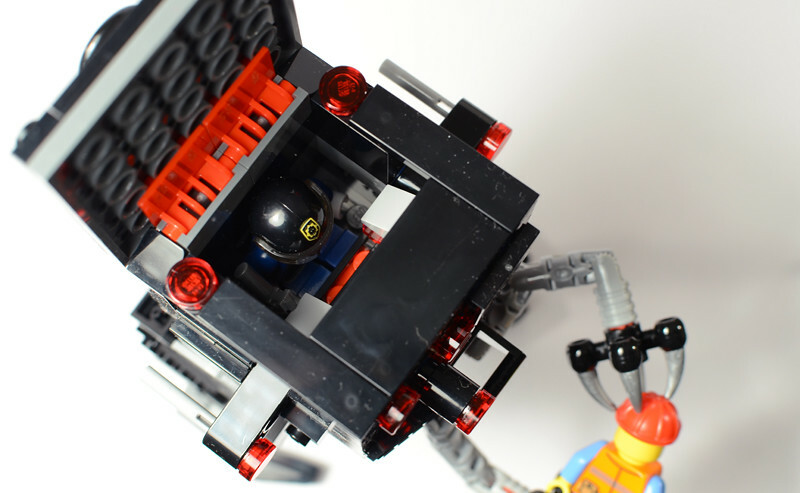 A couple mechs battling and minifigures running around fill the box. 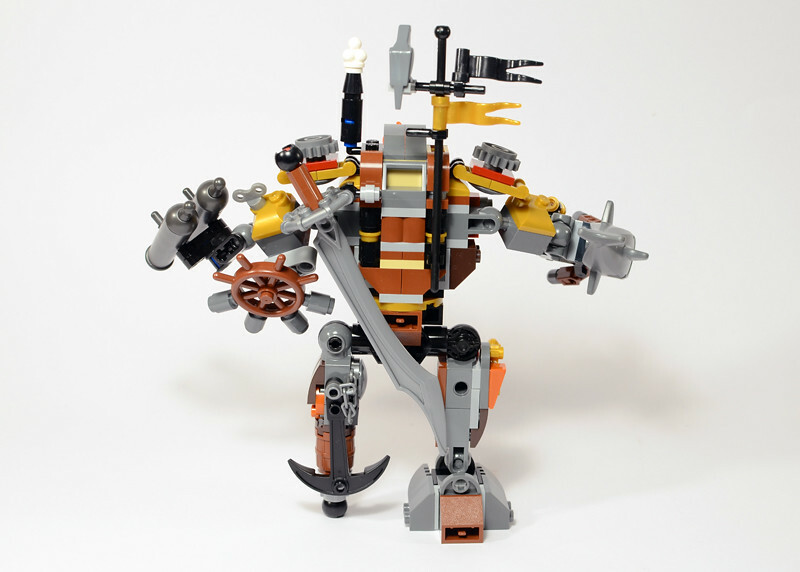 Or, rather, it's more like MetalBeard is holding the Micromanager at arm's length and toying with it. Not much of a duel if you ask me. Somehow MetalBeard always knows where the Robo Skellie is, since he's discharging a cannon straight up as the Skellie jumps at him. The back also highlights things like the sausage and bone MetalBeard keeps in his chest (which I think I actually forgot to photograph… oops). Sorry, Robo Skellie is actually Skeletron - another '80s space theme that never was along with Executron. The other figures aren't the most exciting necessarily; you'd have to want the mech to want the set, I'd say. Since the box is square, and the instructions are also square, they have almost the exact same art. The instructions show just a little bit more, I suppose. Since I haven't mentioned it before in any of these reviews - see the little blue arrow symbol showing you to flip the thing around in step 8? There are SO MANY OF THOSE in these sets. Maybe it's just because I've never built 13 sets so close together before, but these sets have you flip things over and around like crazy in the builds. Maybe this is necessary, but sometimes I felt it was extranneous and I could've figured out what to add without flipping the assembly around. 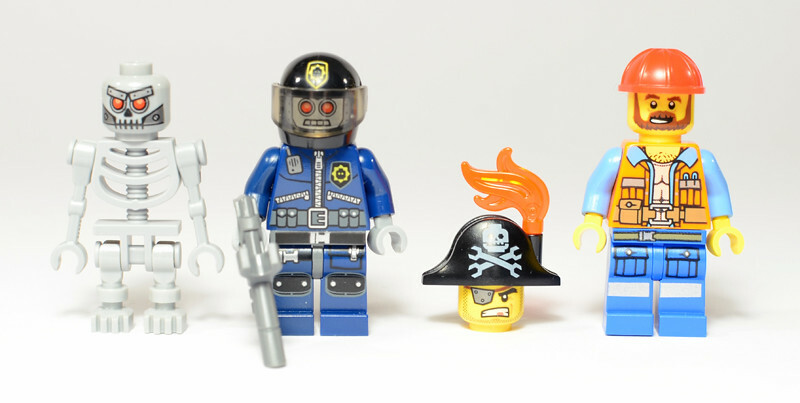 These minifigures are actually pretty cool. This is the first ever bley skeleton, so that should definitely come in handy to people. As I've been saying, the Robo SWAT are always excellent, and this one gives you another printed helmet (though the printed cap in the Melting Room is cooler). MetalBeard has a nice piratey face, with a lovely new pirate hat print that's very nice and LEGO-y. 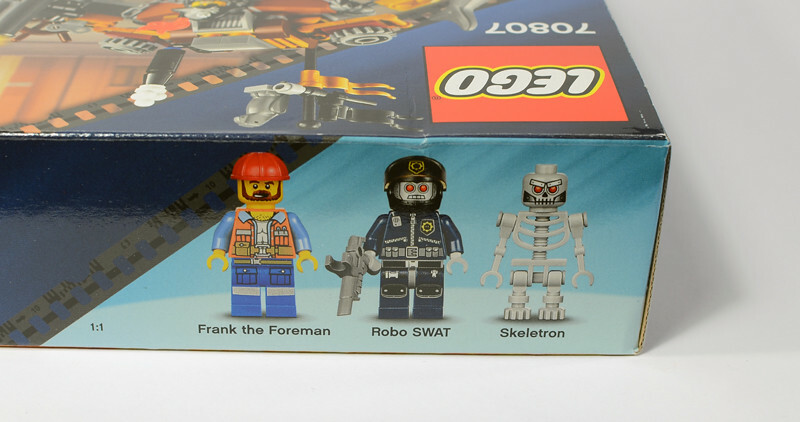 Finally, Frank the Foreman might not be so exciting, but he's got nice new multi-purpose torso and leg prints, and a nice new face to boot (he looks like he could be Garbage Man Grant's twin to me). The two regular figures have good back printing. Here's a more complete look at MetalBeard's face as well - a nice addition to eye-patch pirates if you ask me. I should've included the sausage in this, since sausages are cool, but I frogot. Anyways, this set has the new shark mould that is very similar to the old one. The only differences are the gils on the side and the fact that it more universally attaches to studs on the bottom; the old one has an awkward 1x2 space to attach, whereas this one can be stuck down in the middle of a big plate if you like. The binoculars are new (I believe) in gold, and the wind-up thing is rare to see in sets. This is one of two bigger Micromanagers. It definitely has a different type of appeal - the others are cutesy, whereas this one looks silly because of its tal spindly legs. 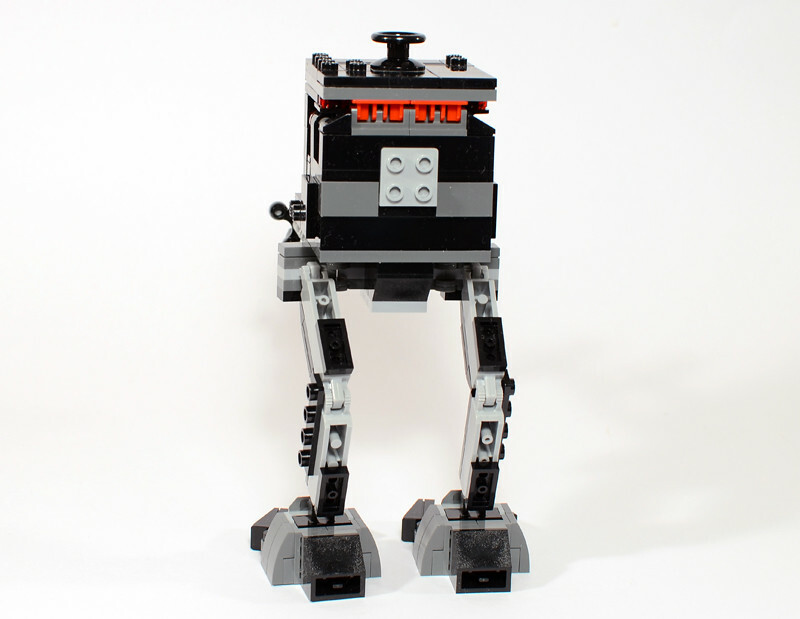 It's kind of like an AT-ST with a box as its head. The sides are pretty ugly unfortunately since they have fold-down flick-fires and also have to be designed for the top to fold open. This leaves them looking messy. The back has another mysterious attachment point to attach to nothing. 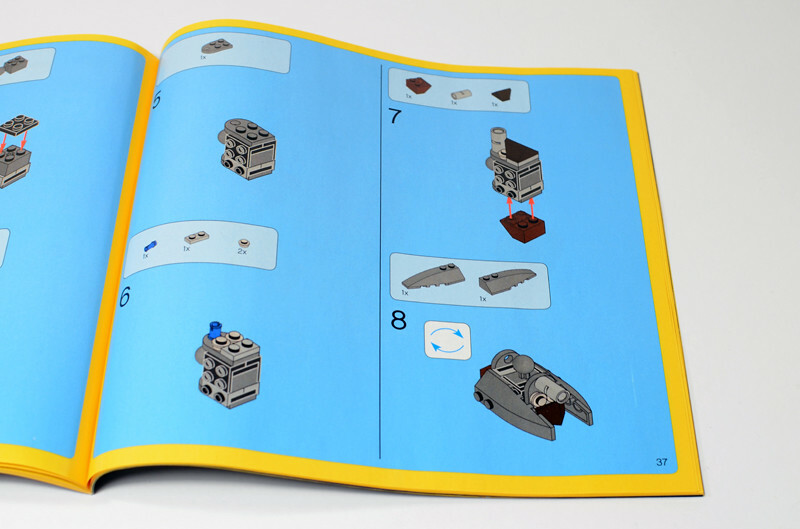 Maybe eventually LEGO will tell us these have some use? 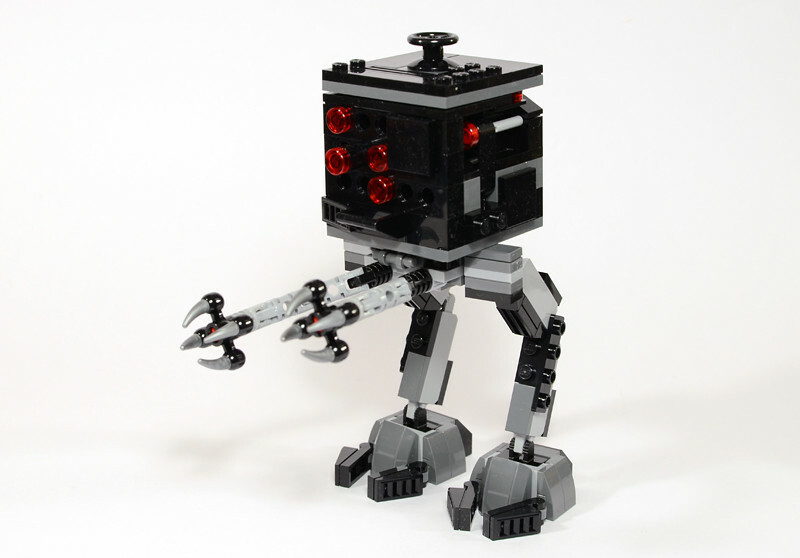 This is the only Micromanager with room inside for a pilot, which seems to me like LEGO's desicion to give a Tank Droid, Droid Gunship, or Vulture Droid a pilot. Aren't these things robots themselves with their own robot brains? Maybe this is just a passenger seat for when the Robo SWAT gets tired, or something. This thing isn't super-duper pose-able, but it can pose well enough. 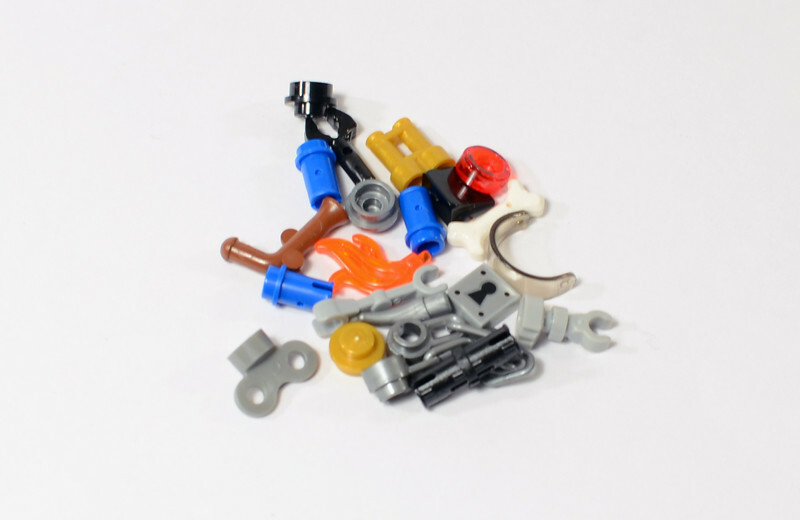 The hand design, also used on a few other Micromanagers, works superbly for holding minifigures since the horn pieces are made out of a bendy material (and have been for a while, though they originally were regular hard LEGO). 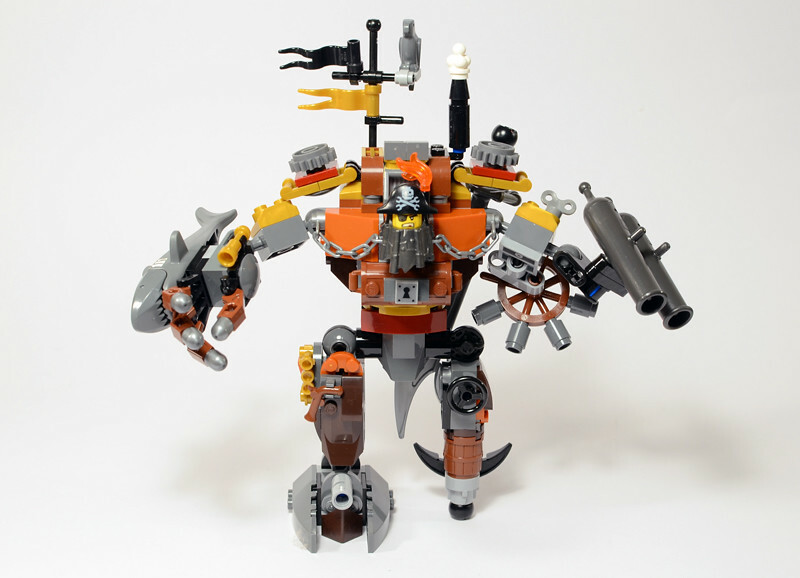 Here he is, the name of the set, MetalBeard! I think opinions will be split over this guy. Some people will love the crazy look, but I'm more in an 'ugly mess' camp. The concept is cool, but in real life his colors are muted overall and it just looks ugly to me. He's also a lot smaller than I expected. He's bulky, but pretty short and doesn't feel 'big' overall. Even though I don't dig the overall look, there are some good parts in there nonetheless, like the new 1x2 slop in dark brown, the dark orange pieces, 2x2 jumper plates in dark red, more gold, just to name a few. There's actually a single dark orange cheese grater piece on one leg (which you can see a bit in this picture), which I believe is exclusive to this set (but will probably pop up in others since I can't see why LEGO would cast it in that color just for this set. MetalBeard can carry his big sword attached to his back, and has a swinging ancor on one leg (it swings freely do to friction-less pins). Besides that, not much detail on the back. 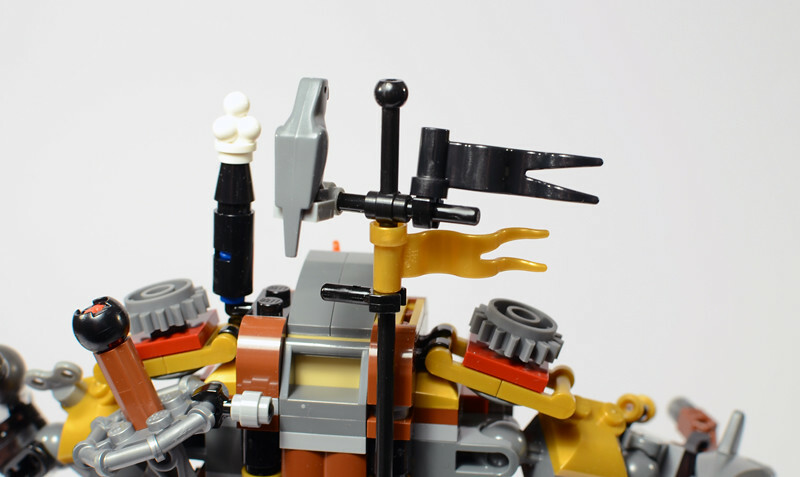 Keen-eyed observers might have noticed a black clip under the gold flag on MetalBeard's flagpole. That's an extra piece and not supposed to be there, but the pole and flag don't have enough friction to keep the flag up by itself. 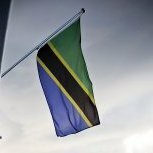 At least on mine, the flag falls down the pole without that clip there. That's what I'd call an NNPU - not nice parts usage. The ice cream for smoke (because MetalBeard has an engine?) is an NPU though, and it's nice to see this NPU in a set since I've been seeing it in MOCs for quite a while. It brings it out to more people, like kids, who might not have thought of that before. The hand doesn't have an attachment point for the sword, but MetalBeard can still hold it fairly well. 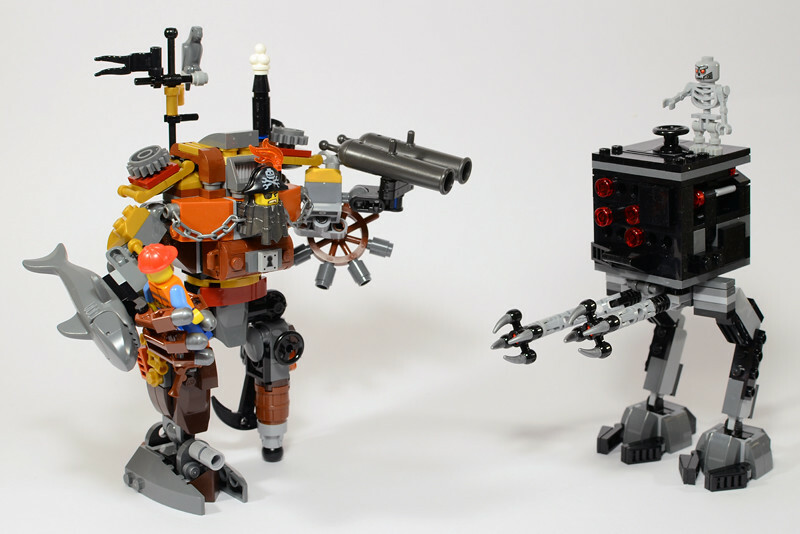 Sadly, and this is why I don't love mechs, MetalBeard can't pose all that well. What's the point of a mech if you can't actually pose it? Is it fun for kids to just hold a mech in each hand and smash them against each other? Ok maybe, but still I'd rather be able to pose my mechs as an AFOL. This is the 'most interesting' thing I could come up with without him toppling over. MetalBeard can nicely turn 360 degrees at his torso, but the peg leg seriously impedes leg posing. I can't say I like this set much. I tried to keep an open mind despite not loving bigger mechs, but MetalBeard feels dull and ugly and this is probably the worst Micromanagers due to messy-looking sides. I actually like MetalBeard a lot more in these pictures than I like him in real life - under nice lighting his colors kind of pop, but in real life under every-day kind of light he's pretty drab. Dark orange and dark red are nice colors, but when mixed with mostly dark colors like dark grey, dark brown, and black they kind of fall flat (I liked dark orange far more back in the Orient Expedition Scorpion Palace, which used a lot of white, for example). Parts-wise, I suppose this set is pretty good. Plenty of interesting parts, and plenty of parts in general for the price. The minifigures are also pretty good and useful. 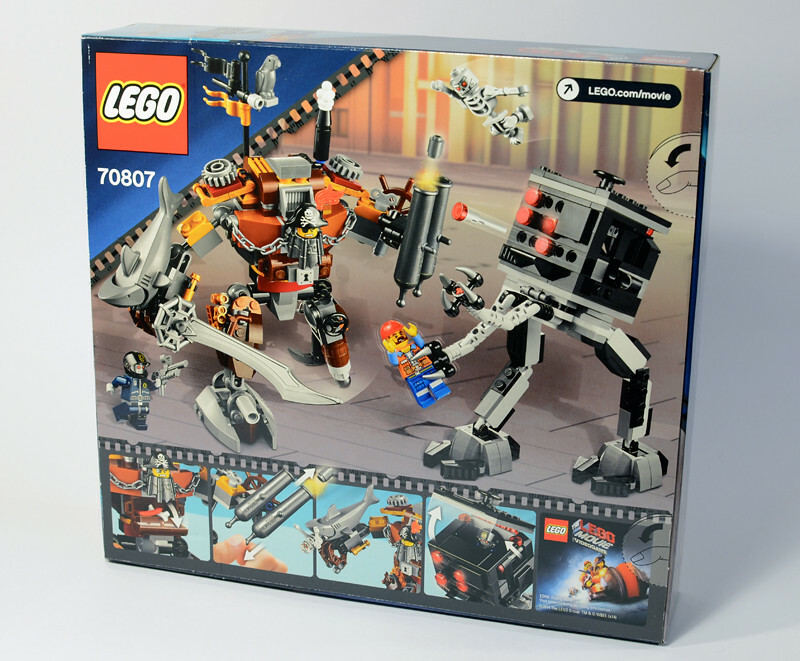 If you're somebody who likes to part out sets and can use the minifigures, this is a decent buy, but I'd say for everybody else it's underwhelming unless you personally really like the look of MetalBeard. I, on the other hand, would recommend any of the five (slightly cheaper) USD 30 sets over this in a heartbeat. 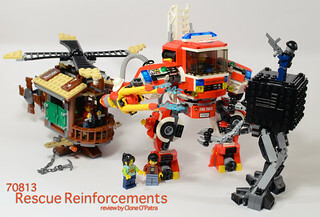 Only one more review left: Rescue Reinforcements. Also a mech set, but (review spoiler alert) that one actually had me pleasantly surprised. Coming soon! The ice cream for smoke (because MetalBeard has an engine?) is an NPU though, and it's nice to see this NPU in a set since I've been seeing it in MOCs for quite a while. It brings it out to more people, like kids, who might not have thought of that before. Can you do a photo of just the pirate parts? 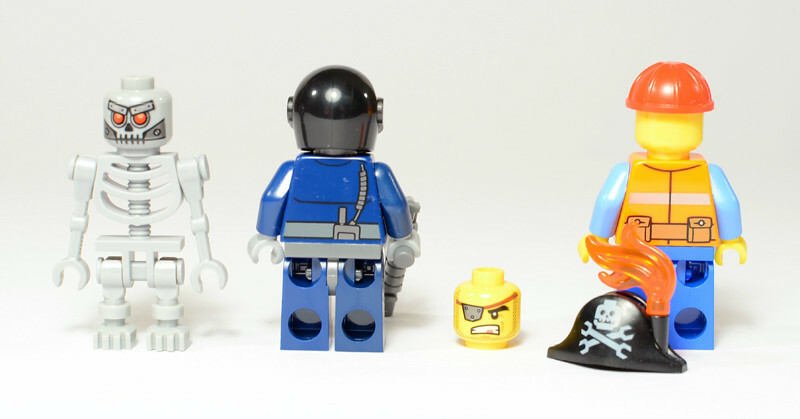 Looks like this would be a great pirate parts pack, what with the steering wheel, shark, cannons, etc. Is there anything that isn't readily apparent in the photos of the built set? I think you named everything besides the periscope, pistol, and flags. If there's anything that leaves you wondering I can try to take a picture at some point, but with the nature of this set and all the cool bits being on the exterior, I think they're visible throughout these pictures. Nah, that's cool--I think I can see everything. I'm quite fond of Metalbeard's design. It's semi-steampunk, and really exemplifies the anachronism that makes steampunk and related genres so appealing in the first place. It's also got the deliciously mottled color scheme you expect of a steampunk model, which is something you don't often see in official sets (which tend to go for brighter and more uniform color schemes). All the nautical details on this set make for added hilarity. You've been doing a great job with these reviews, other sites have been doing them too but I like yours the best. 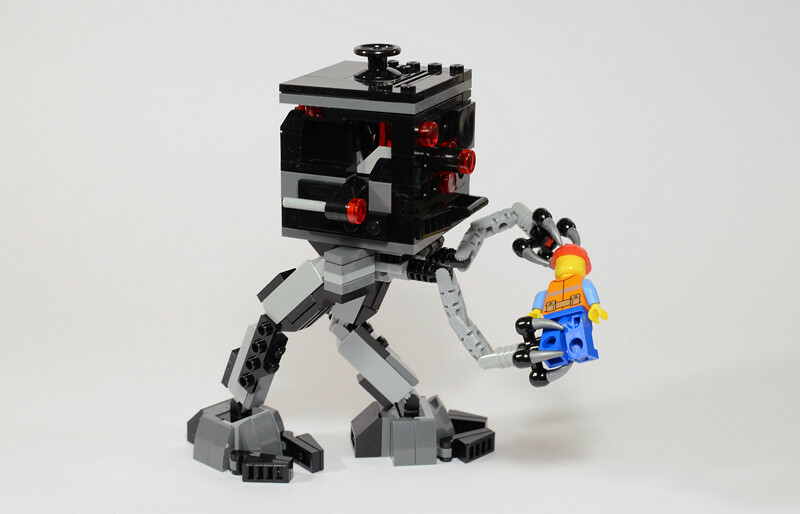 I have been wondering if the the Micromanager bots somehow connect together to form a larger giant Boss Manager. 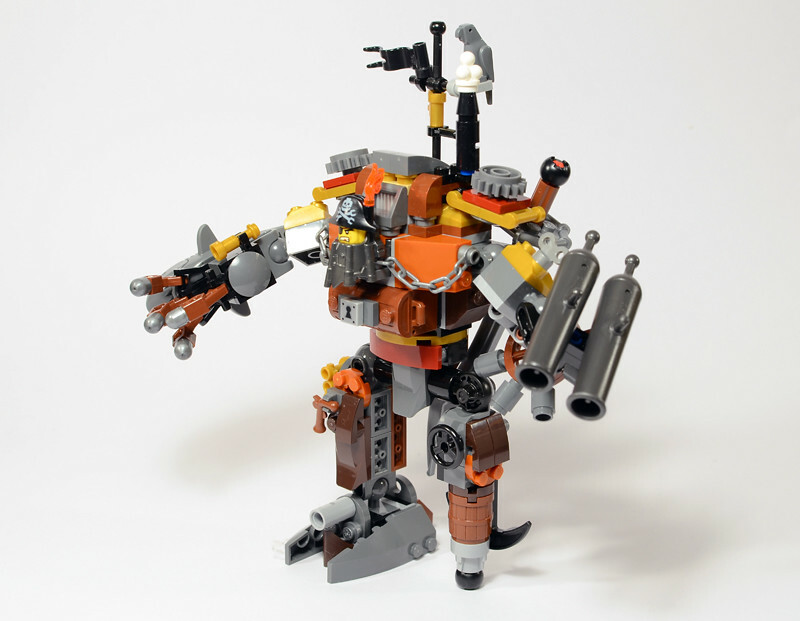 Maybe it would be fighting that construction mech that Emmit will have in the next wave. Now that you've built all the micromanagers do you think this is possible? Now that you've built all the micromanagers do you think this is possible? I really don't think so, at least not without heavy modification, judging on what I remember of them all. I am going to do a 'Theme Overview" topic when I get a chance, so I'll see if I can come up with anything with them. Thanks for your kind comment on my reviews as a whole as well! Great review! I'm kinda conflicted on this set, It's like I like the idea behind it but don't really like the outcome..
Great Pirate parts pack tough! Thanks for all the reviews! They're all great!! What part is sitting underneath Metalbeard's head? Looks new to me, I dont recognize it. That's the metal beard! I should've taken a picture of it (I may add it at some point). It's basically a 2x2 plate (though only with 1x2 stud space) with the beard sticking off, and a stud atop/in the beard to attach a head. Looks great to me! One of my favorite first wave sets. This is one of my favorite and least appealing sets for me at the same time. And both the pros and cons are Metalbeard. He looks so cool with all those pirate-y stuff all over his body, and his sword is just badass. Though I'am very much annoyed by the kneeless mech builds... I hate it so much, Though for the pegleg it can be forgiven. The micromanager is not bad but I would be fine without any of those. However the figures are lovely, the bley skelly is a refreshing color and the worker's torso is very great! Thanks for the review! 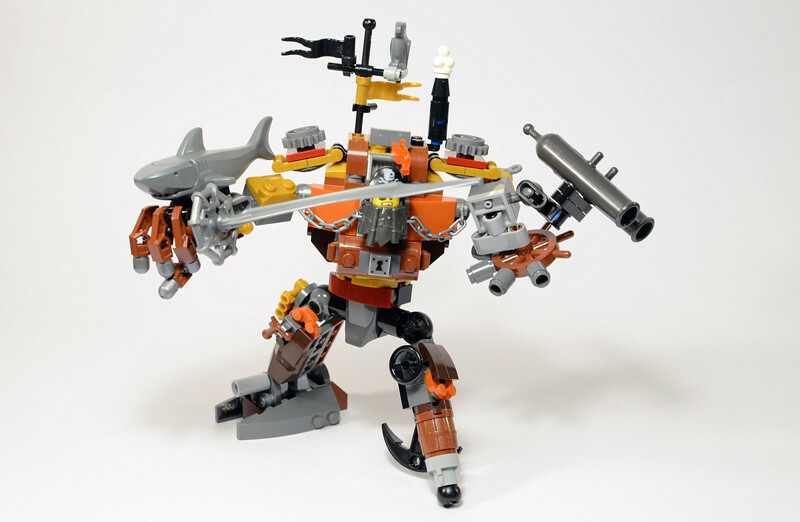 Overall I like the set but I'd rather save money (and/or sell my kidney or something ) for the Sea Cow, where you can get another (maybe better) Metalbeard with the main characters and a crazy looking awesome ship. 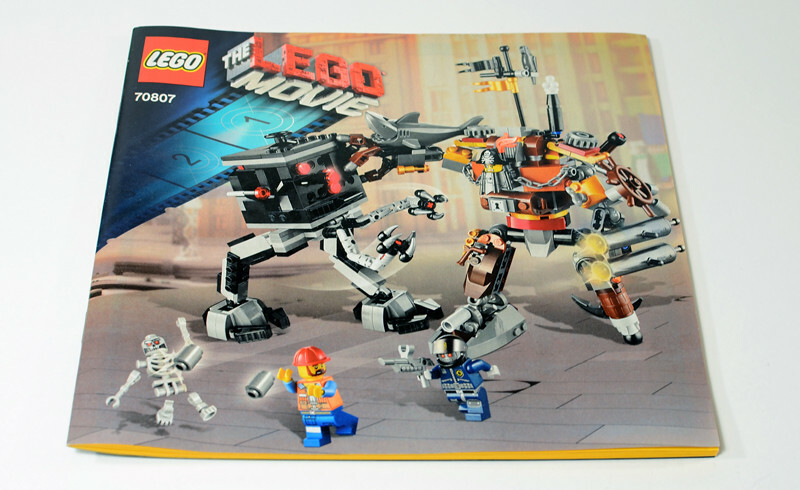 I bought this set yesterday, and even though I only have this and Getaway Glider, this is one of my favourite TLM sets! I'm a sucker for mechs, I can't wait to pick up Rescue Reinforcements! Thanks for the review. 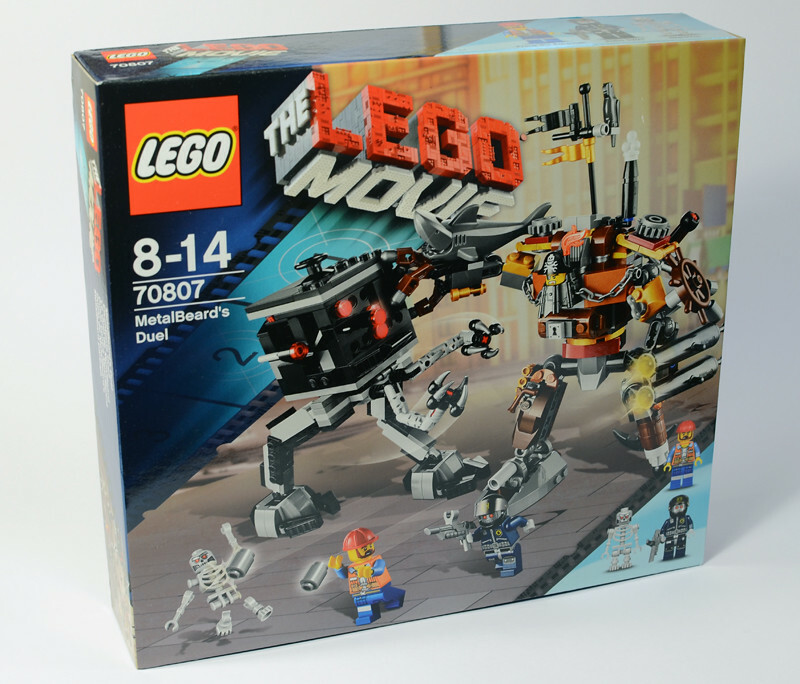 Another great review, but we'll have to differ in our opinions: I think this is a great set - it has a massive steam-punky robo pirate in it after all. Wondaful review cloney. Im tellin' yeh, thise mysterious clips on the micro mangers are for a a Devastator type robot! i like the look of this. 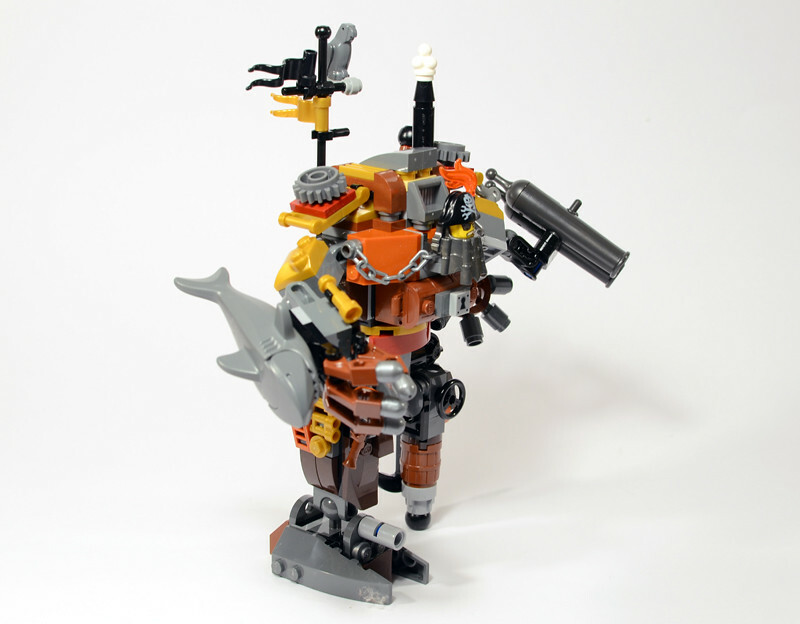 but is the metalbeard in the sea cow set the exact same build? looks like it might be scaled down a bit, does nayone know? Nice set, could you take a picture of the new "metal beard" element? I'm curious to see how it attaches, is there a location for studs on the bottom? I interpreted it as an intestine or something, but it's also possible that his last defeat came in the form of being put through a sausage grinder. Do i spot a dark bl.grey parrot on Metalbeard´s shoulder? Cafe Corner was the last set it came in and it became rather pricey on BL! Nice. I remembered that Samurai X's Meach had a very good posing ability. Has there been a duel between Metalbeard and Samurai X? Yes! You're right - still goes for around $3 a piece on BL… that's crazy! I have a ton of them in old dark grey so I didn't think much of it (BL tells me I must have had 5 dark bley as well from two Harry Potter sets). Clone O'Patra thanks for these fantastic reviews. 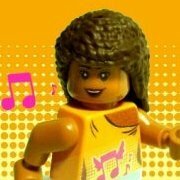 LEGO will be getting lots of my money thanks to you. Would you mind taking a picture of all the Micro Managers together? They are they reason I want some of the sets, they're so adorable!